Back in December I ordered a new bed for our new master bedroom. I purchased the bed shown below from Joss & Main during one of their flash sales. It's no longer available from them but you can get it on Amazon here. Unfortunately it seems like the bed has gotten some bad reviews in regards to the quality of it but I won't be able to see what kind of quality it is until I move into my new place since I have no room to set it up and check it out now. I'm hoping everything will be OK because I'll be unable to return the bed when I move so fingers crossed! 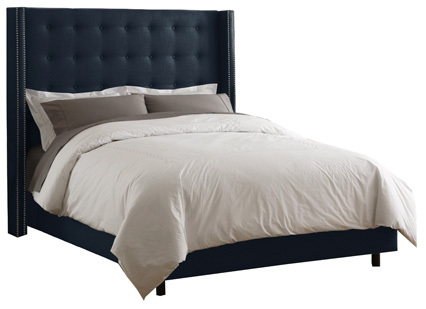 Anyway, I ordered the king size in navy because our new bedroom is going to be much larger than our current bedroom so it can handle a king size bed and it was only $80 more for the larger size so I said why not haha The headboard and side rails are fully upholstered in a gorgeous navy linen blend fabric that is very soft and looks very luxurious. 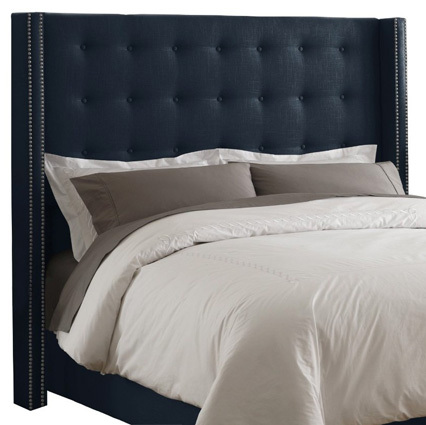 The back of the headboard is tufted and the sides of the headboard have silver nailhead detailing. 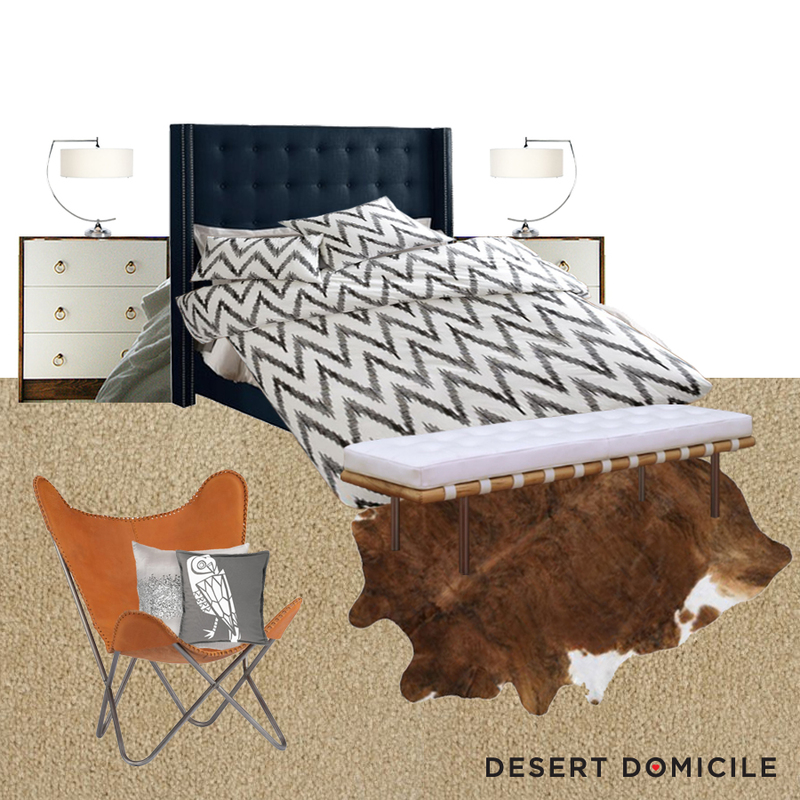 I'm also not a huge fan of the rug we currently have in the bedroom so I plan on using it elsewhere and replacing it with a cowhide. I got one last weekend at the Gem Show that comes to town but I think it's going to be too small for the bedroom so I plan on layering it over my new Nate Berkus rug in the living room. I still need to order this bench and figure out some kind of seating area for the other side of the room and then I need to decide on which artwork is going in the bedroom but other than that, I think it's coming along pretty good! found your blog though a google search for the Rug USA moroccan rug. LOVE it in your bedroom! I was wondering how well its held up? Also love the headboard you ordered- I have ordered from that same company (Skyline Furniture) for my daughters headboard- I will admit it didnt come packaged too well- the box was open, but the headboard itself has held up fine. The moroccan rug has held up pretty well! When I first received it, some of the gray fibers were mixed in with the white and there were some mistakes in the pattern but from far away you can't tell. My dogs like to sleep under our bed and when they crawl out from under it, sometimes their nails get stuck in the rug and pull the fibers loose but that's only happened once or twice and I just cut the loose strands off.